The old cliché is that everything of significance in life is a marathon rather than a sprint. In Japan, such sentiment strains all reason as there is no way that any marathon, economic or otherwise, could possibly be expected to last more twenty-five years. But here it is in 2015, thirty years after the Plaza Accord and BoJ’s first massive monetarism outburst, and QQE somehow still is represented as a hopeful future. Fortunately, even the magic of the largest monetary experiment in history (arguably, as several other central banks seem interested in vying for the most dubious distinction) is no longer so swiftly and easily indoctrinating. Japanese exports have contracted in Q2 at the fastest pace since 2012 “despite” all the yen “stimulus” BoJ could conjure. That is certainly horrible news for Japan still reeling from 2013’s huge economic hole in a similar form of price redistribution. Exports have been mentioned specifically since QQE’s first designs as the primary channel through which the recovery is supposed to flow; lower yen is intended to mean more competitive export pricing and so a greater market share for Japan Inc. 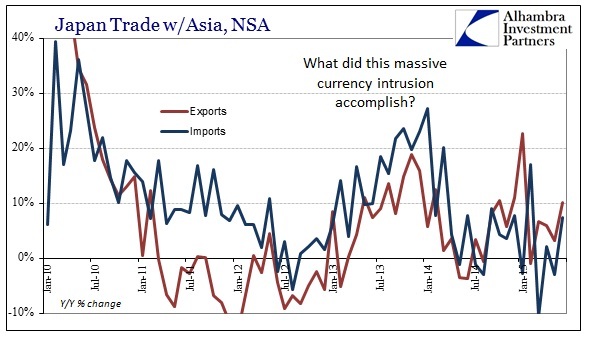 The “unexpected” export decline thus indicates yet again that currency isn’t what orthodox economics believes, including how the global recovery may already be switching into global recession. Those negative results are emphasized further by industrial production figures which show Japan contracting in three of the past four months, totally at odds with how QQE was supposed to be at long last working. 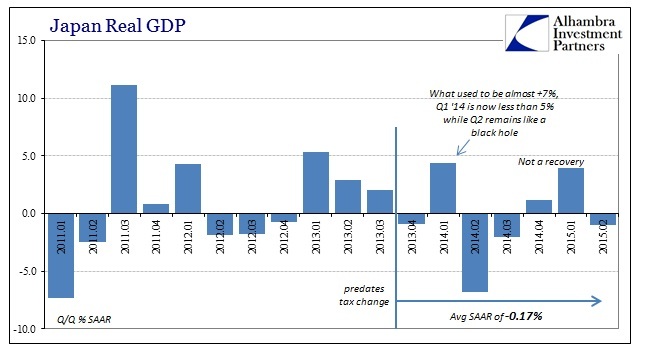 In other words, despite all extrapolations from last quarter’s nearly 4% GDP expansion (which sounds so similar to the US late last year) Q2 GDP is anticipated to be yet again negative. The warning highlights growing caution about resilience of Japan’s recovery, with industrial production dropping in three of the four months through May, and exports falling in the second quarter the most since late 2012, according to Bank of Japan data. How many “soft patches” in a row must Japan undergo in order for the semantics to be discarded entirely. 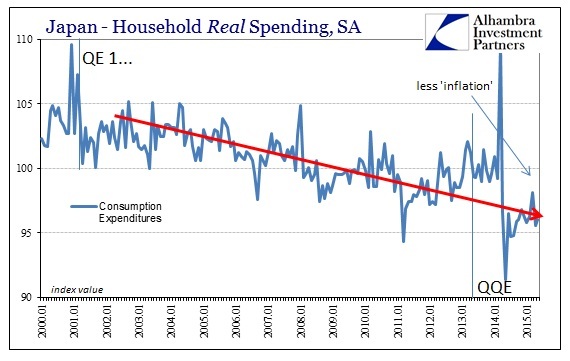 Not only are exports being dragged under again, consumer spending is yet to see any appreciable rebound fourteen months after the tax hike exposed QQE’s grand illusion. The weakness won’t persist this quarter, Governor Haruhiko Kuroda said on July 15, predicting a moderate recovery will continue. The strength of the rebound will be “critical” to judge whether the central bank’s upbeat view on the economy will prevail, said Shinke. The only positive so far has been how Japan’s renewed descent into its familiar form of depression has finally reversed QQE’s impoverishment through the sudden trade deficit. In other words, to regain a positive (or nearly flat) trade balance it was “necessary” to destroy Japan’s internal growth. While exports increase (year-over-year) in nominal terms on the yen’s renewed devaluation last year, imports have not followed unlike the prior building in the first year of QQE. 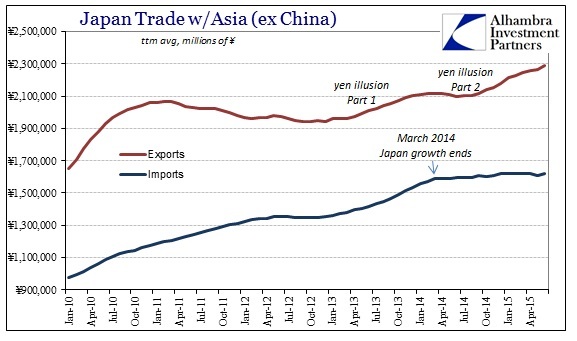 That is another common element uniting Japan’s plight in 2015 with the US, as import demand is suddenly non-existent from anywhere (which is why everywhere from Brazil to Australia to Canada through China have found “unexpected” recessions this year). Even in GDP terms, Japan is clearly in recession having never truly escaped (which could sadly describe all of the last quarter century). 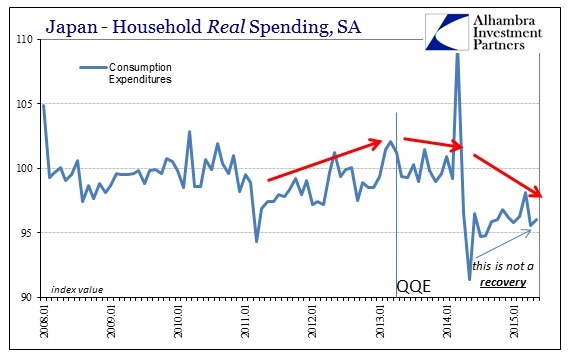 Economists assert that because GDP was up almost 4% in Q1 that amounts to recovery but a true recovery has little to do with quarterly GDP results and everything to do with sustained and obvious growth activity on a broad front. 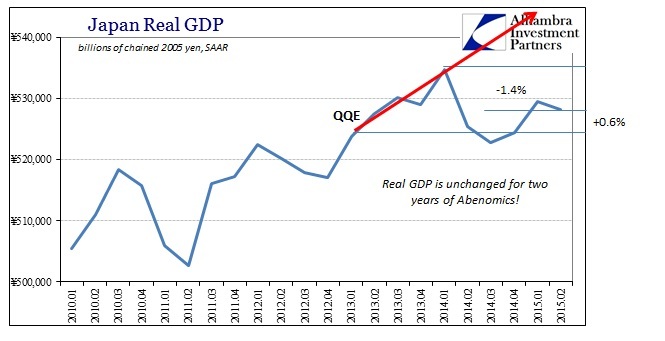 The fact that Japan’s GDP will have contracted (if these guesses turn out) in four of the last seven quarters is rather indicative of serious and ongoing recessionary struggle – especially since GDP itself was made to be the most charitable view on economic progress. 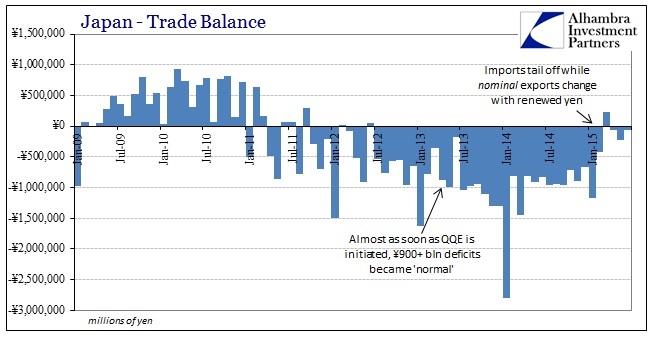 Since QQE amounts to forced instability it really shouldn’t be a surprise to see the economy following that line. The “Q” in the term quantitative easing is just highly misleading as it suggests formulaic precision that has never been proven anywhere but inside orthodox models (which are, therefore, self-referential; monetarism works because the models say it does because the models are built with equations that assume monetarism works). The BoJ, like all central banks, conduct these experiments as if they were precisely prescribed and skillfully carried out in measured doses. The real economic results, in Japan, the US and everywhere else, show that intentional instability is, as common sense suggests, hardly the path toward stable and wanted economic advance. Yet, for all this sustained backward economic resolution, monetary policy is still treated as if monetarism has (past tense) yielded a recovery. That is, again, the difference between positive numbers (that are only sometimes positive) and what a real recovery should look like; a recovery is not an economy that simply stops getting worse after the huge depression that traces directly back to monetarism in the first place. At this point, with contraction showing up in so many places, the only difference between Japan and the US is about fifteen years.